Publication Announcement! 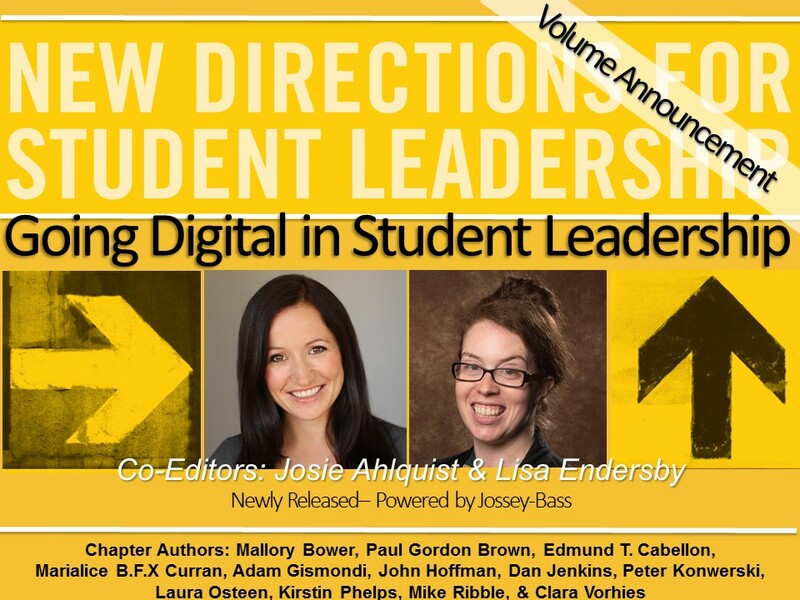 Going Digital in Student Leadership | Lisa Endersby – Canadian professional in higher education working to pedestals and create paths for success. | Exploring the idea(l)s of success, learning, and teaching across the physical and virtual spaces of education. Dr. Josie Ahlquist and I are so excited to share that our edited publication, Going Digital in Student Leadership is released!! When we started this process in the Spring of 2015, we had a vision for what this publication could be, but that vision only became a reality with the hard work and dedication of a fantastic team of authors. Writing about technology and leadership is challenging because of how quickly things change; yet, our authors represent some of the most innovative group of faculty and administrators committed to exploring how technology has, does, and will continue to shape the role of the leader both inside the classroom and beyond the walls of the institution. Our own writing was particularly informative as both of us are continuing our own research in technology and leadership development, for publications, presentations, and (for one of us) that elusive dissertation. · Explore the idea of leadership in the digital age, playing with definitions, examples and curriculum especially for college students. This NDSL volume is a call to action for our colleagues to inspire new and uniquely innovative ways of both challenging and supporting our emerging student leaders. For those in graduate programs or new to the field seeking a text to help augment their leadership development pedagogy focused on technology or for those practitioners ready to incorporate digital tools to enhance student leadership curriculum and practices, this book is for you! We are grateful to all our chapter authors for their willingness to work with us on this project and to Dr. Kathy Guthrie and Dr. Susan Komives for their support along the way! We hope you’ll check it out and would love to hear your feedback! Ahlquist, J., & Endersby, L. (2017). Going digital in student leadership (New Directions for Student Leadership, No. 153). San Francisco, CA: Jossey-Bass. Author(s). (2017). Chapter title. In J. Ahlquist & L. Endersby (Eds. ), Going digital in student leadership (New Directions for Student Leadership, No. 153, pp. ___ – ____). San Francisco, CA: Jossey-Bass. Cabellon, E., & Brown, P. (2017). Remixing leadership practices with emerging technologies. In J. Ahlquist & L. Endersby (Eds. ), Going digital in student leadership (New Directions for Student Leadership, No. 153, pp. 9-20). San Francisco, CA: Jossey-Bass.